House plants are commonly used for indoor decorative purposes. It gives an instant bright and luxury look to the room. A simple plant can make a lot of difference to the appearance of your home. Hanging plants are amazing natural home decors. Proper maintenance and innovative display of the plants will result in creating stylish green interiors. 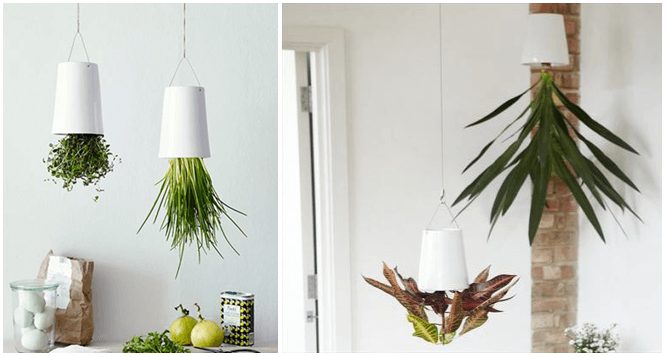 Find below some ideas to grow indoor hanging plants and go crazy in love with nature. Go green right at your front door. Wall mounted planter pots add unusual beauty to the entrance. Amaze and impress everyone with the green gardenia wrought iron wall bracket holder, modern hanging plant stands and create a welcoming look by adding ferns or succulents depending on your choice and interest. Container gardening is the best choice for indoors which lacks space for a full blown garden. A hanging planter creates a lovely natural atmosphere without taking up a lot of space. 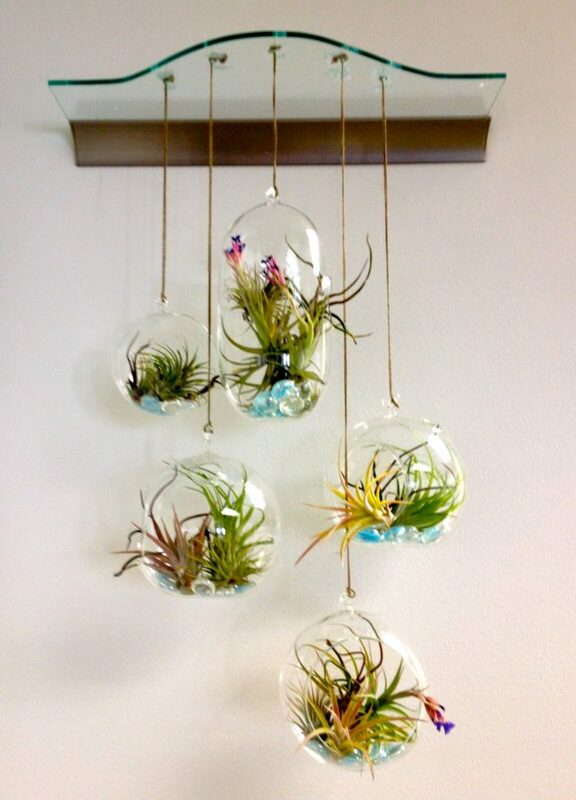 The terrarium hanging glass bubble air plant container is sure to fetch fascinating look to your modern living room. Cornering plants attract and hold the attention creating an unusual charm to the space. 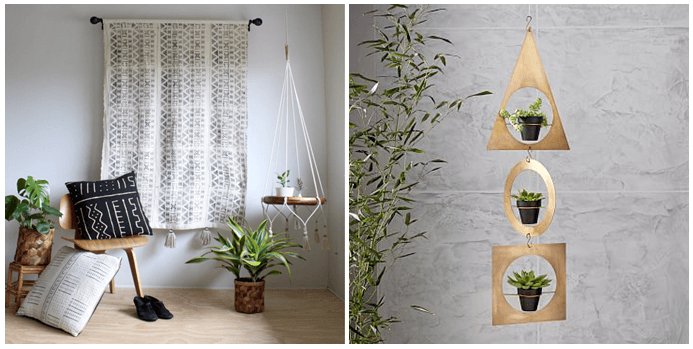 The geometrical metal planter and the macramé plant hanger gives an exclusive dashing look to simple dull corners. Choose orchids, aloe Vera for these elegant containers and get ready to steal the show. 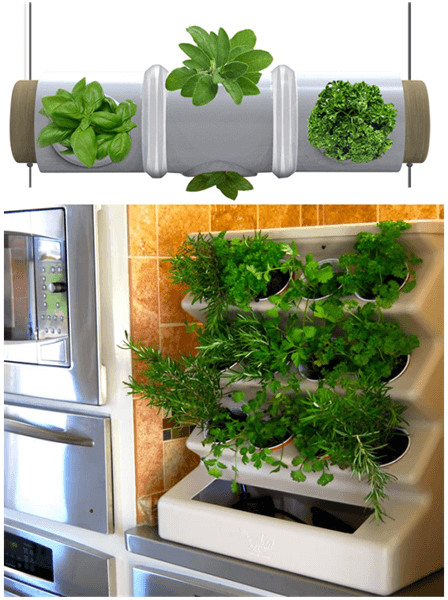 Vertical gardening is a great idea for kitchens. It takes a very little space and is attractive and useful too. You can even bring green in your own unique designs to match the style of your room. Try this white contemporary garden planter or the landscape designer hanging garden for growing herbs. Climbing house plants brighten up and cheer the indoor mood. These kind of plants grow best in hanging pots. Choose suitable containers which helps in supporting growth. 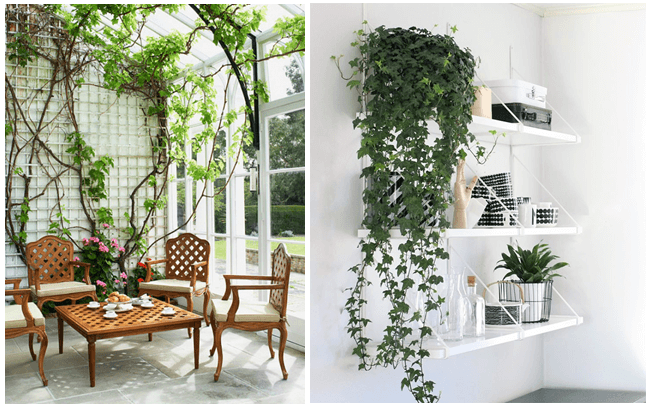 Swedish ivy, spider plant, devil’s ivy are the popular choices among climbing varieties. Plants in sky planters are always unique and interesting in its appearance. These planters are proven to feed water gradually to keep the plants fresh. Anthrium, geranium, Hoyas, orchids are best to thrive in sky planters. Just transform the style of your home with these sky planter plants. Porcelain planters are the popular choices among home owners. The circle hanging planter is classy in its look and is best for succulents. Never miss the wood log holder when planning for a stunning cacti display. Even the simple geometrical shaped planters with plants could bring a magical charm to the entire space. Hanging planters allows us to add a lot more indoor greenery with ease. Choosing the perfect planter pot for the plants is an added bonus in displaying the beauty of the plant. Try these simple and elegant plant hanging ideas to enhance the visual appeal of your loving space. 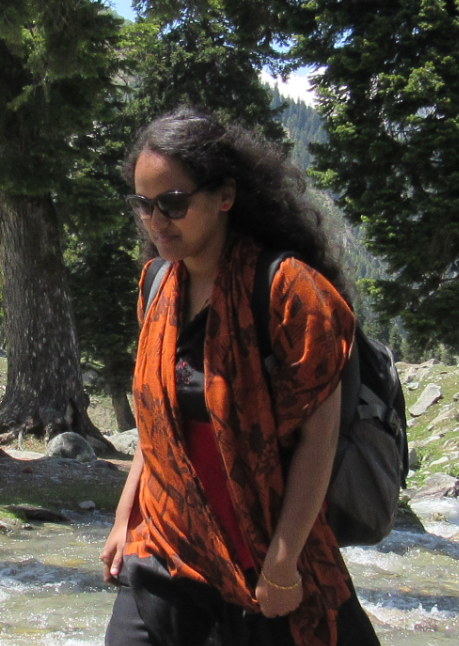 WISHES TO LOVE AND LIVE IN THE BEAUTY OF NATURE AROUND…….